The High Line at the Rail Yards is the third and northernmost section of the High Line park. One half-mile in length, this section runs between West 30th and West 34th Streets to the south and north, and 10th and 12th Avenues to the east and west. 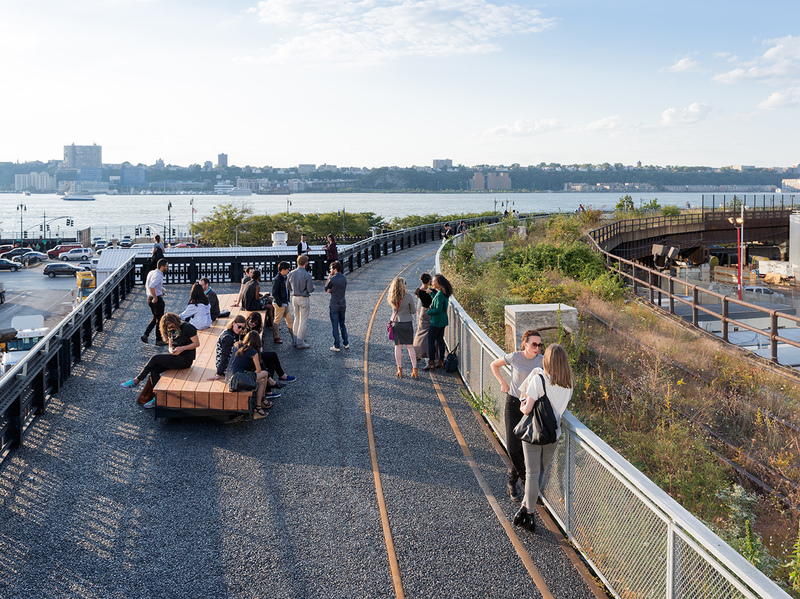 After more than 15 years of advocacy, the High Line at the Rail Yards opened to the public on September 21, 2014; we celebrated this moment by hosting a week of special programming on the High Line. At the Rail Yards, you’ll find several new design features to explore. See below to learn more. The Grasslands Grove is a serene gathering space near 30th Street. In addition to secluded seating and communal picnic areas, the Grove also houses an assortment of new design elements, including the peel-up sound bench – a chime feature for children – and the peel-up rocker. 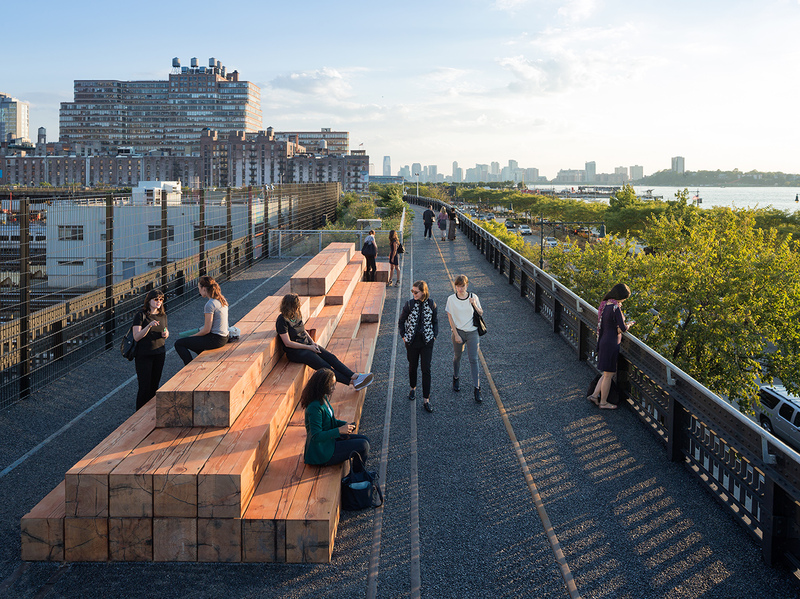 These three linear walks – located in different areas along the Rail Yards – reveal the High Line’s rail tracks, evoking the High Line’s history as an active freight rail line. On these walks, visitors can interact with artifacts such as the rail “frog” and the rail switches, or rest in one of several alcove pockets of peel-up benches located throughout the pathways. Planting beds featuring Piet Oudolf’s naturalistic landscape border the pathways. 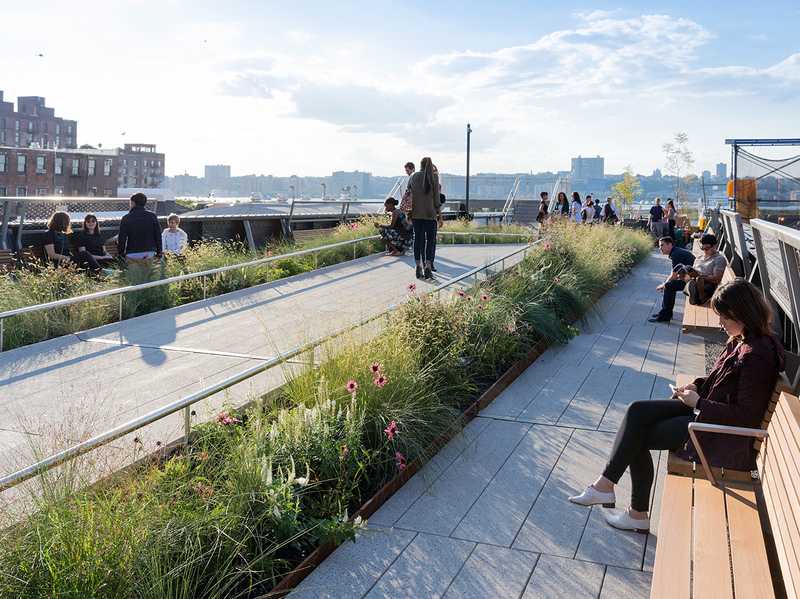 As the High Line runs west over 11th Avenue, the main pathway gradually slopes up about two feet, creating an elevated catwalk from which visitors can view the park, cityscape, and Hudson River. Lush display gardens on either side of the catwalk separate the main pathway from the more intimate linear bench seating running along the railing on either side of the bridge. Just west of 11th Avenue is a unique design feature for kids, the Pershing Square Beams. Here the High Line’s concrete deck is stripped away, revealing the original framework of steel beams and girders. The structure itself is transformed into a series of sunken areas – coated in a silicone surface for safety – that children can run between, climb over, and play within. 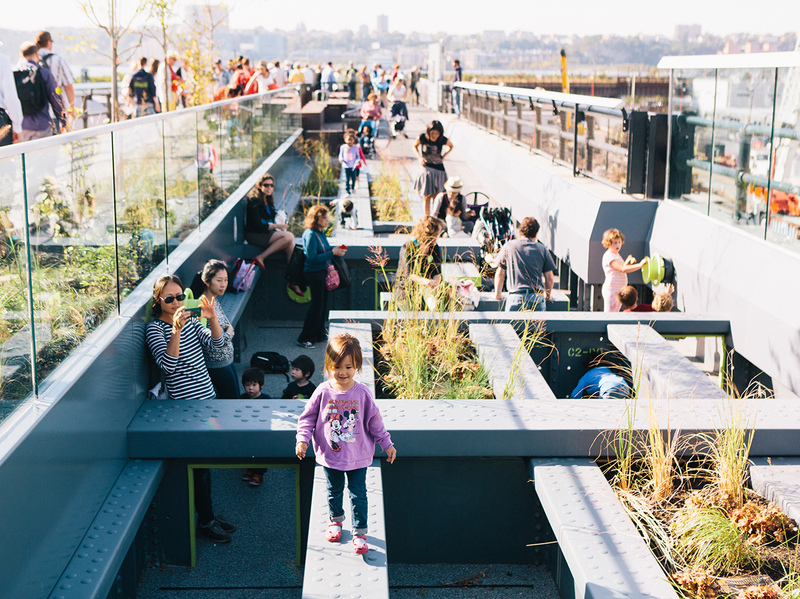 The area also includes a series of interactive elements developed exclusively for the High Line, such as a rotating beam, periscopes, a gopher hole, and talking and viewing tubes. At the park’s northernmost point is the Interim Walkway. This area features a simple path through the existing self-seeded plantings, celebrating the urban landscape that emerged on the High Line after the trains stopped running in 1980. 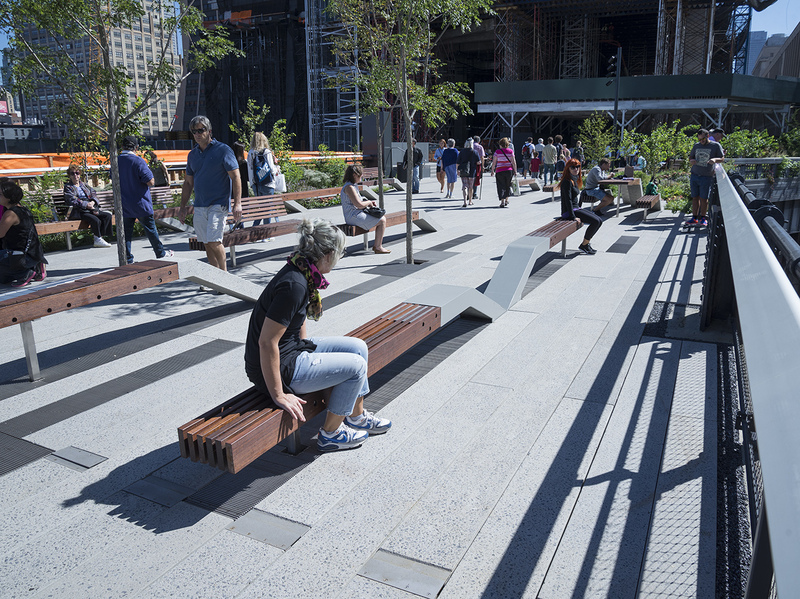 Visitors can take in expansive views of the Hudson River and the cityscape, or relax in any of the four gathering spaces located in this area. Because the Interim Walkway is not lit at night, this part of the park closes earlier – at sunset. The Interim Walkway also features a site-specific High Line Art commission by Adrián Villar Rojas. The series of abstract sculptures, composed partly with seeds and compost from the High Line, will be on view through the summer of 2015. Over the course of the yearlong installation, Rojas’s seemingly sturdy sculptures will crumble and sprout new growth.